30 watts at less than 3% distortion. 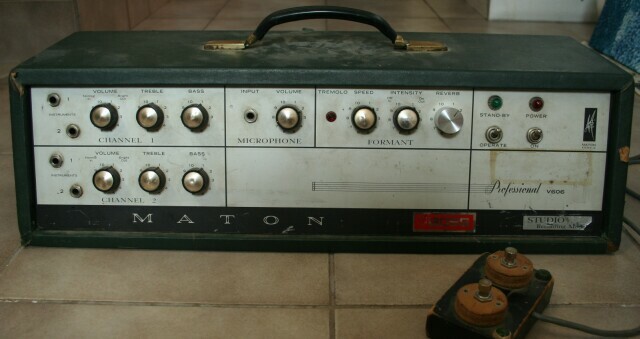 Another Maton flyer gives the speaker set up in the 30x as “4x 8-inch” and in the Super 30x as a 12-inch and an 8-inch using a crossover network. BIG photo of underchassis 427kb jpeg. Reverb is vastly improved and Tremolo finally works!!!! Should sound even better once it burns in a bit more. 1 x 12AX7, 2x 6GW8's. One 12-inch speaker, heavy-duty in the EP model, sealed cabinet. Deceptively plain but quite functional closed-back small amp of around 18 watts output. The EP model was intended for keyboards so doubtless stands for Electric Piano, being fairly common at the time.